Bourges Basket and Aix-en-Provence's LFB match should be quickly forgotten by both coaches. 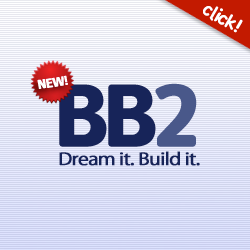 The DVD will never be released. The game was a festival of errors and poor shooting. But Bourges dug themselves out of jail in the last five minutes to win (51-44). No player from Bourges reached double digits. However Anäel Lardy was given the player of the match award. Basket Landes fell at home (73-81) to Villeneuve d'Ascq. 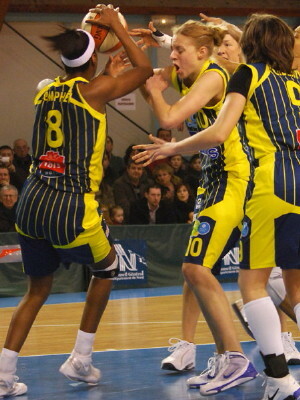 Emilie Gomis (left) led the Villeneuve attack with 26 points of which 13 points came from the free-throw line. Basket Landes trailed by 13 points going into the final quarter. With three minutes to play they had reduced their deficit to 5 points. Yet they did not come any closer. Toulouse were pushed all the way by Limoges before securing the victory (71-66), while Aurélie Cibert led COB Calais to victory against Armentières (63-51). In the first LFB game on Sunday, Montpellier lost at home to Nantes-Rezé (52-64). This defeat leaves their play-off ambitions in jeopardy. Arras trailed by 8 points at the start of the final quarter but ended up beating Mondeville (68-59) to stay in third position. 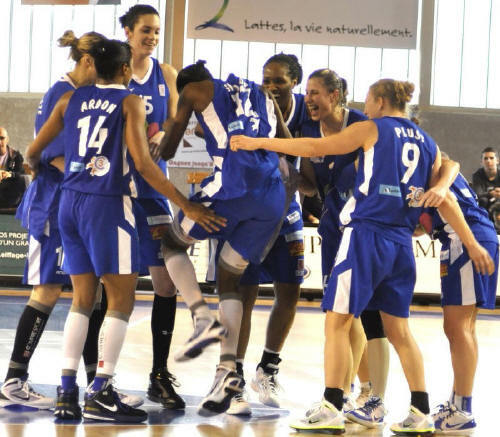 Tarbes ended the 19th round of the LFB with a road victory (74-62) against Challes-les-Eaux. 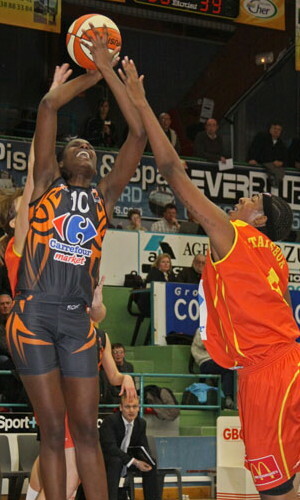 Isabelle Yacoubou-Dehoui was again the player of the match with 28 points. This was the first defeat for Challes-les-Eaux in 2010. The LFB match was delayed because Bourges Basket were required to change from their home colours because it clashed with the colours of Aix-en-Provence. Emméline Ndongue, the captain from Bourges, was suffering from a stomach bug and was not 100% fit for the game. The first quarter was a festival in the art of missing from both sides. Bourges Basket started slowly and scored 6 of their first 8 points from the charity stripes as they edged the first quarter (12-6). Jennifer Digbeu (left) hit the first three-pointer of the game at the start of the second quarter. However the quality of the match did not improve. Digbeu was on target again for Bourges, this time from two-point territory. Bourges Basket went 13 points clear with 13 minutes played (19-6). Yet Bourges failed to pick up their game and also stopped defending the perimeter. Aix-en-Provence made Pierre Vincent (right) angry by finishing the quarter with 4 three-pointers to go into the locker room with the advantage (28-26). It was a more focused Bourges Basket after the break. They scored 4 quick points (30-28) to regain the lead. 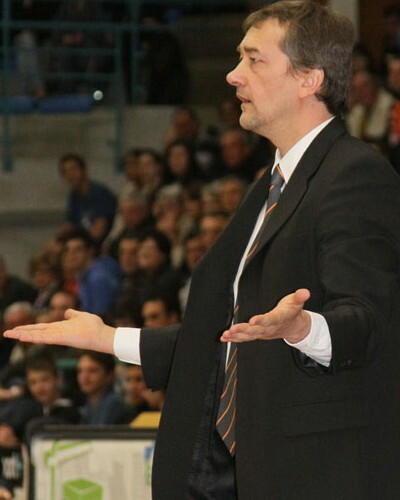 This resulted in Emmanuel Coeuret calling for a time-out after only 90 seconds for Aix-en-Provence. Aix then switched to zone which stopped Bourges from scoring. However they were not much better in scoring despite taking the lead (34-30). It was the turn of Vincent to use a time-out with three minutes remaining in the quarter. The pace of the game picked up after the time-out. Anäel Lardy (left) hit a trey for Bourges to the delight of the home supporters. Aix hit back almost immediately with Julie Page and a trey by Claire Tomaszewski (Tom-Tom) which enabled them to go into the final quarter ahead (39-38). The officials were not having a good game. They were out of sync at the start of the final quarter when they disagreed on a decision that sent the home fans into frenzy. Both teams just managed 2 points during the first four minutes of the quarter. So once again it was time for a time-out for Aix-en-Provence. Bourges picked up their game with Styliani Kaltsidou firing in a trey. This action was quickly followed by a three-point play by Ilona Burgrova to put Bourges back into the lead (46-41) with five minutes left to play. The rest of the points came from the free-throw line in a disappointing LFB encounter. Bourges Basket have reversed their defeat against Aix earlier in the season with a victory (51-44). Lardy and Kaltsidou led the Bourges attack with 9 points each while Tomaszeswki and Claudia Das Neves scored 11 and 10 points each for Aix. This was an important match for SO Armentières and COB Calais in the battle against LFB relegation. The game started slowly with just 4 points scored during the first four minutes (2-2). Calais then picked up the pace. With Lauren Neaves and Jennifer Humphrey winning the battle in the paint Calais opened the first lead of the game (11-5). 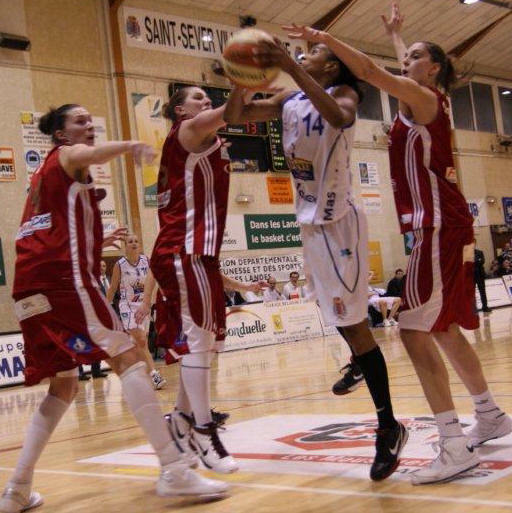 Mia Fisher picked up Armentières with her typical drives to the basket. 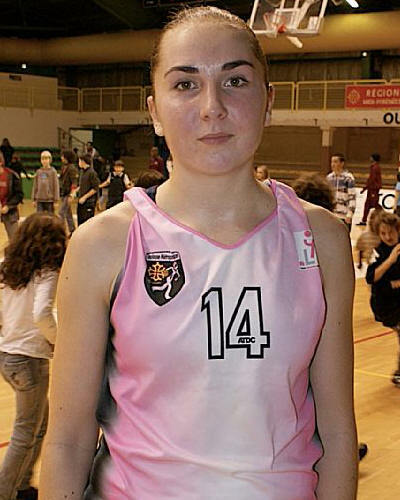 Marie-Frédérique Ayissi and Gaetan Merlot helped out offensively for the home team to win the first quarter (17-13). Cyril Sicsic asked his inside players to be more aggressive at the start of the second quarter. Neaves was a little too aggressive and was soon on the bench with 3 fouls. Yet with Humphrey holding her own inside and with Aurélie Cibert and Elizabeth Egnell shooting from outside, Calais went into the locker room leading (33-26). Armentières' hope of making something of the game went early in the third quarter when Coral Duval (30-33) was issued with a technical foul. Their concentration went and Calais fired in 14 unanswered points (47-30). Ayissi (15 points) brought an end to Calais' run with four minutes left to play in the quarter. The guests went into the final quarter leading (53-40). They more or less ended the game as a contest (57-40) with six minutes left to play. The two teams played out the rest of the game with Calais coasting to victory (63-51). Cibert led the scoring for COB Calais with 16 points while Egnell and Humphrey (17 rebounds) finished with 13 points each. There were fireworks from the tip-off with Villeneuve d’Ascq starting the game with a couple of three-pointers. Aja Parham opened her account for Basket Landes with a shot from behind the arc. Basket Landes' relief was short lived: Elodie Bertal got the guests back on track with two more three-pointers as her side went 11 points clear (16-5) with just over five minute played. Defense went out of the window as both teams traded baskets for the rest of the quarter with Villeneuve maintaining their advantage (28-18). The two sides continued to play offensive basketball all through the second quarter with neither of them being able to gain the upper hand. Villeneuve d’Ascq went into the locker room leading (51-41). After the break Villeneuve stamped their authority on the game with Bertal and Emilie Gomis leading the way to go 17 points clear (62-45). The hosts, with in particular Parham, continued to battle to go into the final quarter trailing (60-73). Basket Landes then took advantage of their opponents' last-quarter jitters to score the first 8 points (68-73) to set up a dramatic finish. However Gomis and Lady Comfort put an end to Basket Landes' uproar with 5 quick points. Villeneuve went on to win their third consecutive LFB match (81-73). Gomis led the scoring with 26 points. She also drew 10 fouls. Bertal, Jolene Anderson and Ana Cata-Chitiga contributed 15, 11 and 10 points each. Parham (right) was the best player on the field and scored 22 points in defeat. Limoges surprised their hosts Toulouse at the start of the game by scoring the first 8 points of the game. They led (13-4) midway through the quarter. Bintou Dieme on her début for Toulouse and Emilie Maurice put an end to the onslaught. They contributed 6 points to their side's 11-2 run to finish on level terms after ten minutes. The second quarter belonged to Kateryna Dorogobuzova (12 points in picture) from Toulouse who fired in 3 three-pointer. Her first trey put Toulouse into the lead (18-15). Despite both teams trading baskets her final three-pointer enabled the hosts to go into the locker room ahead (40-36). The third quarter was a typical LFB match between teams struggling at the wrong end of the table. There was a lot of heart, physical clashes, players falling all over the court, very entertaining but low on technique. 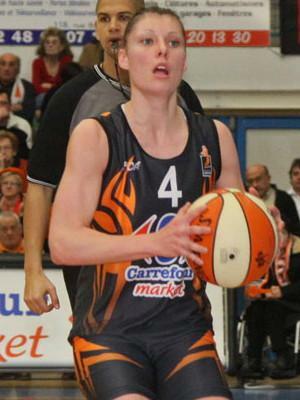 Milica Belanski split a pair of free-throws for Toulouse to lead (50-49) at the end of the third quarter. Toulouse stayed in front all through the last ten minutes thanks to solid defending and excellent work from Agathe N'Nindjem-Yolemp (18 points) and Maurice (13 points) to win (71-66). The player of the match was Awe Geye from Limoges with a game high 29 points. Can Nantes-Rezé start to think about the LFB play-offs? Pauline Krawczyk required five seconds to open her account for Montpellier. She scored again by splitting a pair of free-throws. Then Alexia Plagnard made it (5-0) with 90 seconds played. Mame-Marie Sy-Diop started the Nantes-Rezé revival and with three minutes left to play in the quarter Lindsay Taylor put the guests in front (6-5). Montpellier regained the lead briefly through Constance Jinks but 5 late points including a trey by Sy-Diop allowed the team of Laurant Buffard to win the first quarter (15-9). The second quarter was an even affair with the big ladies in the paint from both teams taking over the show. Sandra Dijon-Gérardin was all over the place for Montpellier, rebounding, defending, drawing fouls and getting assists. However Taylor (16 points) from Nantes did a little more than Dijon-Géradin (13 points). She scored the last 6 points of the quarter which included a three-pointer for Nantes to go into the locker room ahead (31-23). Nantes changed tactics after the break and went to the outside shooting of Leslie Ardon, Kathleen MacLeod and Yuliya Andreyeva. Montpellier struggled with the offensive system of Nantes and fell behind by 20 points (34-54) after a trey by Mélanie Plust with a minutes left to play in the quarter. Dijon-Géradin had not given up the game for Montpellier and scored 3-of-4 from the charity stripes to finish the scoring (37-54). Montpellier were more aggressive during the final quarter and started to bring the score down with several trips to the free-throw line. A trey by Krawczyk with three minutes to play (52-59) forced Laurent Buffard to call for a time-out. Buffard brought back Ardon and Sy-Diop into the game and Montpellier failed to score again. Sy-Diop (19 points) finished the game with a buzzer beater three-pointer for Nantes-Rezé to win the game (64-52). Nantes-Rezé will stay in the battle for a LFB play-off spot while Montpellier are now two games behind. Mondeville's injury plagued season continues with Temeka Johnson joining Lenae Williams on the injured list for this weekend game. Arras, playing at home, struggled for 30 minutes against their guests from Mondeville and went into the final quarter trailing (42-50). With a trey Sarah Michel tied the game (54-54) with just over six minutes left to play. Pauline Akonga Nsimbo (15 points) put Arras in the lead for good. But it was Johanne Gomis (17 points- in picture) with 7 consecutive points that put the game out of the reach for Mondeville. Arras won (68-59) and held on to third place in the LFB standings. Challes-les-Eaux' 2010 unbeaten series has come to an end with a home defeat against Tarbes (62-74). With the victory Tarbes have booked their ticket for the LFB championship play-offs. Isabelle Yacoubou-Dehoui was again the player of the match with a double double of 28 points and 10 rebounds. Fatimatou Sacko and Frida Eldebrink scored 15 and 14 points each while Florence Lepron dished out 5 assists and collected 11 rebounds. Laina Badiane was the leading scorer for Challes with 17 points.